Possibly Alluded to in Proverbs. "He that tilleth his land shall have plenty of bread, but he that followeth after vain things [A. V. "vain persons"] is void of understanding" (Prov. xii. 11). "Wealth gotten by vanity shall be diminished, but he that gathereth by labor shall have increase" (ib. xiii. 11, A. V.). "He that maketh haste to be rich shall not be unpunished" (ib. xxviii. 20, A. V.). "He that hasteth after riches hath an evil eye, and knoweth not that want [or disgrace] shall overcome him". An interesting case of betting is related in Ab. R. N. xv. and Shab. 30d et seq. : "Two men (A and B) bet whether it was possible to provoke Hillel to anger. One of them (A) said, 'I can do it.' They agreed that, if he did provoke Hillel to anger he should receive from the other (B) 400 zuz [the alternative of the bet, that in case of failure he was to pay to B the same amount, is not mentioned]. He tried his best, but failed. Then he exclaimed: 'If thou art Hillel, the prince of Israel, I hope that there are not many in Israel like thee; for through thee I lose 400 zuz.' Hillel replied: 'Learn to control thyself; the lesson learnt by Hillel's patience is worth even twice the stake.'" If two parties have bound themselves by a bet, however blamable the act of betting may be, they have to act in accordance with the moral precept, "That which is gone out of thy lips thou shalt observe and do" (Deut. xxiii. 24 [R. V. 23]). They are at least morally bound; but it is not certain whether the loser is also forced by law to abide by the agreement. In the Mishnah (R. H. i. 8; Sanh. iii. 3) betting seems to be among the vices that disqualify those addicted to them from giving evidence. The passage runs thus: "The following are disqualified from giving evidence: He who plays at dice ["meẓaḥeḳ be-ḳubia"] or lends on interest, or bets on pigeons." The original for the last expression is "mafriḥe yonim" (literally, "causing pigeons to fly") and is thus explained in the Gemara (Sanh. 25a): "If thy pigeon comes before the other" [supply] "then I pay thee so and so much." Another explanation is offered by Ḥama, who can not adopt the first definition of "mafriḥe yonim," because the principle of betting is already mentioned in the phrase "playing at dice." Two reasons are given why a betting man can not be heard as witness: (1) Rami b. Ḥama says: "The winner has no right to take the money of the loser; and if he takes it, he is guilty of robbery." (2) Rab Sheshet says: "A person addicted to betting wastes his time in idleness, and does not fulfil his duty as a human being of contributing by his work his share to the welfare of mankind." ["eno 'oseḳ beyishshubo shel 'olam"]. Both agree that betting disqualifies a person from giving evidence, but with this difference: Rami b. Ḥama declares a betting man guilty of robbery, and therefore disqualified even if he bets only occasionally; while Rab Sheshet would not declare him disqualified, unless betting is his sole occupation (Sanh. 24b). Whether a betting man is guilty of robbery or not depends on the legal value of the betting transaction. Two parties frequently agree to certain conditions, because either party hopes to gain by them, and thinks only of the one eventuality that is favorable to him. The reverse seems to him to be out of question; and neither party is actually prepared for the loss. Such a transaction is called "asmakta" (see Asmakta). Rab Sheshet denies that the rule of asmakta applies to the case of meẓaḥeḳ be-ḳubia, or playing at dice. The Tosafot, in discussing this subject, come to the conclusion that when a certain sum of money is laid on the table with the understanding that the winner shall take it, the transaction is legally valid; but that games which are played on credit are asmakta, and the stake is not recoverable by law. 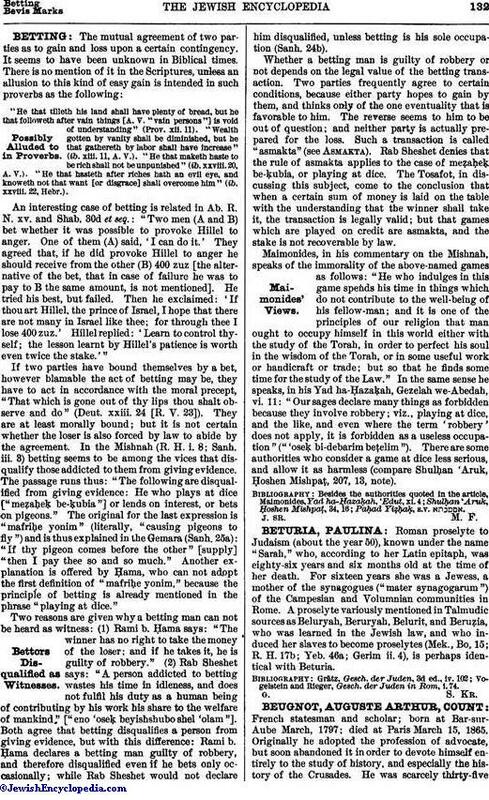 Maimonides, in his commentary on the Mishnah, speaks of the immorality of the above-named games as follows: "He who indulges in this game spends his time in things which do not contribute to the well-being of his fellow-man; and it is one of the principles of our religion that man ought to occupy himself in this world either with the study of the Torah, in order to perfect his soul in the wisdom of the Torah, or in some useful work or handicraft or trade; but so that he finds some time for the study of the Law." In the same sense he speaks, in his Yad ha-Ḥazaḳah, Gezelah we-Abedah, vi. 11: "Our sages declare many things as forbidden because they involve robbery; viz., playing at dice, and the like, and even where the term 'robbery' does not apply, it is forbidden as a useless occupation" ("'oseḳ bi-debarim beṭelim"). There are some authorities who consider a game at dice less serious, and allow it as harmless (compare Shulḥan 'Aruk, Ḥoshen Mishpaṭ, 207, 13, note).